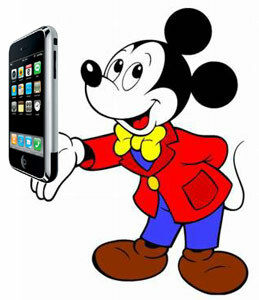 Disney’s new iPhone app, launched today, rewards users for checking out Disney.com. The company plans to eventually offer exclusive bonuses for shopping at Disney Stores. The necessary mobile push for Disney comes along with the company’s move to catch up with the times, with Apple’s Steve Jobs leading their in-store experience redesign efforts. The app is free, and features a digital game called “Click2Life” where users must take photos of characters from Disney movies on its website, which make those images come to life on their phones. Capturing the correct images also unlocks exclusive video and downloadable content such as frame images that can be overlaid on photos and wallpaper for cell phone screens. Smart play, Disney marketers. In the future, the app will likely feature clues inside Disney stores, and could allow bonus ontent to be delivered to phones based on their location. Already an online and mobile Web powerhouse, Disney.com reaches nearly 31 million unique visitors per month, ranking as the No. 1 Community-Family & Parenting site. Among mobile Web sites, Disney.com ranks as the No. 1 entertainment mobile site. The Disney App also automatically discovers other Disney-branded iPhone and iPod touch apps and games like Toy Story Mania!, Disney Fairies Fly and The Nightmare Before Christmas, organizing all relevant content within one destination to simplify access.